Better than wasteful plastic wrap and gives you a better seal too! 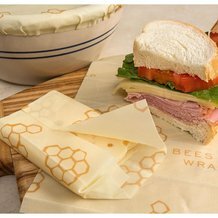 Since these muslin cloth wraps are handmade with beeswax, the warmth of your hands helps mold them to bowls and dishes, then seals when cool. Includes 3 sizes: 7"x8", 10"x11" and 13"x14"
The beeswax and jojoba oil have antibacterial qualities that help to keep your food fresh and allow you to use the wrap over and over. To care: Wash wrap in cool water with mild dish soap. Do not expose to heat. Air dry and fold. 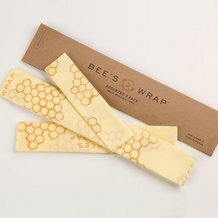 Made of beeswax, organic cotton, jojoba oil and tree resin.